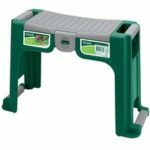 Reduce knee and back pain from gardening with a garden kneeler seat which can be used as a garden kneeler pad or stool. 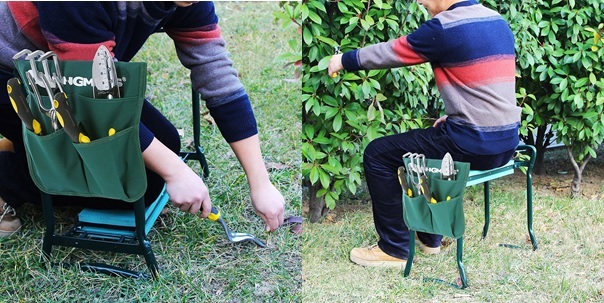 Gardening usually requires you to kneel, stand, bend, squat and sit in awkward and uncomfortable positions. Staying in these positions for a long period of time can be very painful but thankfully there is a solution. 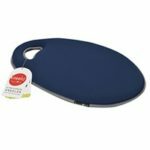 A garden kneeler seat is basically a garden kneeler with handles which can be used for support and balance, and of course the kneeler itself is a soft foam pad where you rest your knees on. Then when you flip it upside down it becomes a stool to do those mid-level jobs which you would have had to stand up to do otherwise. 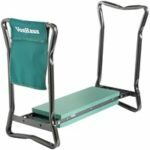 So now that you have an idea of how a garden kneeler seat can benefit you, it’s time to go through its features so you can choose the best garden kneeler. 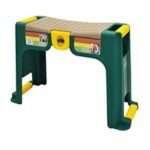 Garden kneeler and seat – Can be used as a kneeler or stool, some will have a pouch on the side to hold your tools or a compartment under the seat. 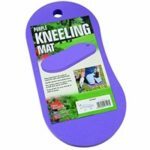 Garden kneeler pad – Will only allow you to use it for tasks that require you to be on your knees. 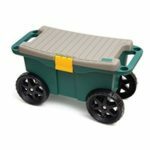 Garden seat with wheels – Like a tool box which can be sat on but with wheels for easy mobility. With some models the seat is detachable so it can also be used as a kneeling pad. 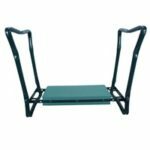 Handles – When a garden kneeler with handles is used for kneeling tasks, the legs will stick up which can be used as handles for support and balance. Kneeling & sitting – Able to complete tasks that require you to kneel and sit. Sitting for certain tasks will take a lot of strain off your back, legs, joints and muscles. 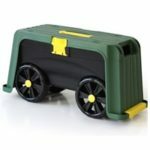 Tools holder/storage – Some models will come with a tools holder strapped to the side, enabling tools to be within arm’s reach. This can make completing tasks easier since your tools are kept in one place and you don’t have to scatter them loose on the floor. On the other hand, if there’s storage under the seat, you can keep your tools there even when you’re not using them. However during tasks you’ll have to take your tools out beforehand otherwise you’ll have to keep opening the seat to get your tools out. With this type of tools storage, your tools are not within easy reach like the former. 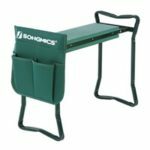 Foldable – A folding garden kneeler seat will save space when it’s not in use as it can be placed inside an outdoor storage box or shed. 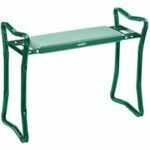 Alternatively, it can be used as a seat during gatherings or barbecue parties. Maximum user weight – The kneeler pads won’t have a maximum weight limit as your weight is supported by the ground. Despite kneeling seats being strong and sturdy there is a weight limit, however you can choose a model with a higher maximum weight limit if you prefer. Dimensions – Your main concern in regards to the dimensions might be the height as it’s not adjustable. If you’re going to be using kneeling stool to sit on for certain jobs, you’ll need to make sure the stool is at a height that’s comfortable for you. Weight – Generally lightweight and easy to carry around.